The gastrointestinal (GI) tract is a finely balanced environment where roughly 500 different strains of bacteria compete for space and nutrients. The natural microflora balance can be disrupted by medications, such as antibiotics, or poor dietary intake. One of the key benefits of probiotics is their ability to increase populations of healthy bacteria in the face of microflora imbalance. In addition, extensive research has identified other broad health benefits, including supporting healthy bowel function, increasing the production of important short-chain fatty acids that provide energy to the cells of the intestinal lining, boosting immune function, aiding in the digestion of difficult-to-break-down compounds like lactose and casein, and enhancing detoxification of harmful compounds. Because probiotics are living organisms, there are various challenges associated with their manufacturing and distribution. For a probiotic to be effective, it must be shelf-stable through the expiration date and precisely delivered to the intestinal tract, where it can have maximum benefit. The microorganisms in FloraBoost are protected, sealed, and freeze dried away from moisture, heat, light and oxygen. This allows the bacteria to remain dormant until they are exposed to moisture in the GI tract. FloraBoost is a probiotic formula for children, designed to deliver live bacteria that promote healthy gut microflora, protect intestinal integrity and boost immune function. The formula contains three strains of Lactobacilli and three strains of Bifidobacteria, as well as Streptococcus thermophilus and Saccharomyces boulardii, an extensively researched microorganism shown to help restore microflora balance by enhancing commensal organism function. The eight strains in FloraBoost have been strategically selected based on research supporting their survivability and adherence to the intestinal tract. 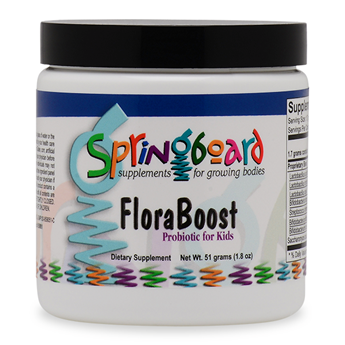 FloraBoost comes in a powder form for easy administration to children.